NEWPORT BEACH — The Fourth of July is several months away, but the Newport Beach council chamber was filled with fireworks Feb. 10 as freshly elected council members and veterans of the dais exchanged barbs for 20 minutes during a discussion and vote on a bid for concrete docks at Marina Park. Council members narrowly approved a $3.2 million bid for Bellingham Marine Industries to construct a concrete dock as part of the new Marina Park project on Balboa Peninsula. The park, which sits on 10 acres and would include a 23-slip visitor marina, is currently under construction. However, at least two councilmen — both of whom were elected to the council as part of the Team Newport slate in November 2014 — believe the bill for the new docks is too expensive. In a town full of fancy cars and large houses boasting unique architecture, the council members who challenged the $3.2 million price tag used “Taj Mahal” and “Rolls Royce” to negatively describe Marina Park’s design and marina. Accordingly, Councilman Marshall Duffield asked his colleagues to reconsider the design and materials of the new docks. Design: Concrete, Wood or Fiberglass? Councilman Scott Peotter supported Duffield’s motion and said he hoped to replace the concrete design with an alternative motif. However, Mayor Ed Selich said concrete is being used for the new docks being added in Alamitos Bay Marina and Marina del Rey. He added a consultant informed him wooden docks would not result in any cost savings. Cost Savings: Substantial or Nonexistent? Peotter estimated the city could save up to $2 million by ditching the concrete design and instead using fiberglass or wood. Interestingly enough, Duffield did not agree with Peotter’s savings estimate but did believe some money could be saved. In a substitute motion seeking to move forward with the bid as suggested by city staff, Councilman Tony Petros used one of Duffield’s arguments to challenge Peotter’s cost-saving estimate. City staff told council members the decision to design the dockd with concrete elements was made a while back. 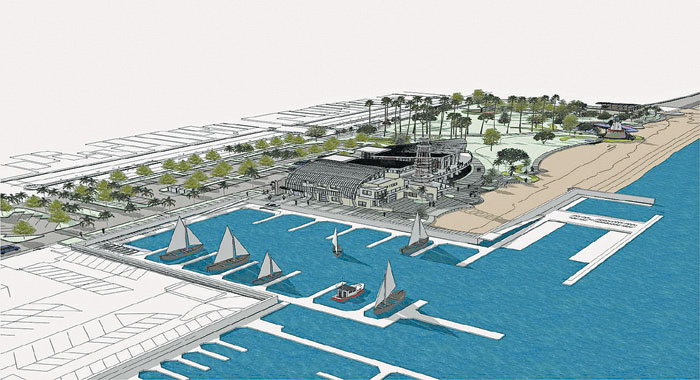 If the council elected to change the docks’ design, city staff said the docks would not be ready in time for Marina Park’s opening in December and questioned whether any savings would be incurred by switching from concrete to fiberglass or wood. City staff added permits have already been pulled for the current design of the docks. Accordingly, restarting the process now would likely delay the completion of the docks, as city staff would have to find a new bidder and complete new permitting paperwork, all of which takes time. Councilman Keith D. Curry expressed frustration with Duffield’s motion. He said the city’s panel of elected officials, highlighted by the addition of four new members from the Team Newport bloc who won seats on the dais in November 2014, has been mired in a series of missteps. Specifically, Curry said the current council has approved inaccurate minutes and appointed an ineligible candidate to a city commission. “There’s a time and place to deal with these issues. We have to stop making up this stuff up here on the dais and throwing stuff out there for staff, because it’s messing up the way the city is working, it’s messing up our processes and it’s going to delay this project in a very significant way,” Curry said in a thinly veiled comment directed toward members of Team Newport. Curry said the time and place to discuss the design of the docks had already passed. “I appreciate the expertise Mr. Duffield brings to this, and the opportunity to make improvements as we go along, but the time to do that is not when the item is coming here for action; it’s in the design process earlier,” Curry said. At least one Newport Beach resident was unhappy with how the city council members handled the discussion of the bids for Marina Park docks. Curry retorted any changes to the project at this point would be a disservice to the public process. “Mr. Peotter has pulled out $2 million. Mr. Duffield, with more expertise, says that’s not a correct number. Staff says there might not be any savings altogether. We do know [any changes] will delay the project,” Curry said. “Fundamentally, it is wrong for us as council people to sit here, based upon what some guy said at the gym or who we’ve talked to down the line or in an ex parte way says, ‘here’s how you ought to do it,’ and, on that basis, change the entire public process we followed to get to this point. “For my new colleagues who haven’t experienced this before, there’s not an investment banker, or a construction engineer, or a chemical engineer, or a trash provider out there who won’t tell you they could’ve have done it cheaper, better, faster than the guy who ultimately got hired and has a responsibility for doing it. I think we ought to trust staff,” Curry continued. The final vote was 4-3 in favor of city staff’s original suggestion. Those who opposed awarding Bellingham Marine the $3.2 million contract were council members Duffield, Peotter and Kevin Muldoon.